Can a surgery change lives? If your answer is no, you are wrong. Many patients walk in to cosmetic surgery clinics looking for solutions to their problems. However, there a many more who return to enhance their body and gain more self-confidence that they previously had. One such individual, *Sagar Naik has an interesting story. This is how his life went from fat to fit and fit to fabulous. Naik is a 27 years old young man who was quite obese. Weighting a 110 kg, he desperately tried to lose weight through diet and exercise. 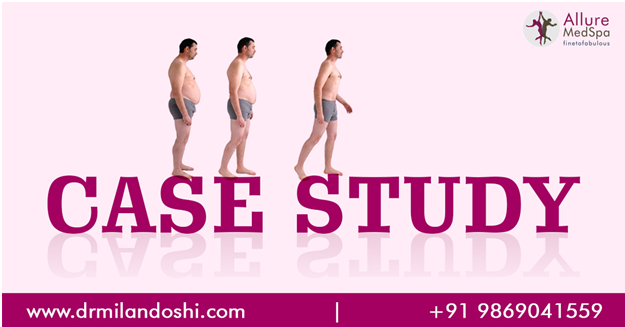 After a long struggle, his efforts paid off and he lost the weight he desperately sought to lose. However, that landed him with another problem, sagging skin. His biggest concern at this point was Gynecomastia (enlarged male breast). Having enlarged male breast was embarrassing and he wanted to get rid of it as soon as possible. He had undergone Gynecomastia surgery earlier but was unhappy with the results. When Naik came to us at Allure MedSpa, it was decided that belt plasty to fix the sagging skin on his abdomen and back was the way to go. This was combined it with a six-pack liposuction. The results were immediate and he was awestruck by it. He was ecstatic with the results that made him look so good. This prompted him to change his wardrobe for better fitting clothes that would flatter his new body and suit his new personality. Impressed by the changes in his upper body, he decided to bring about changes to his lower body as well. He wanted to tighten the sagging skin on his thighs. He was asked to shed a few more kg so his thighs could be defined as well. Therefore, after another three months he successfully underwent thigh lift surgery. His surgeries not only gave him a new lease at life but also restored his faith in cosmetic surgery. This led him to come back to Allure Medspa for his revision Gynecomastia surgery. His journey of self discovery and a better body continued as he got himself fat injections to his face for better face continue. This young man’s life underwent a complete change. Not to mention he is quite happy with the results and revels in his new found self-confidence and an evidently better life. Anyone who wishes to make these changes can have them. The first step in the journey of body enhancement is a choice that people need to make.